1.4 Download the Passport artwork! 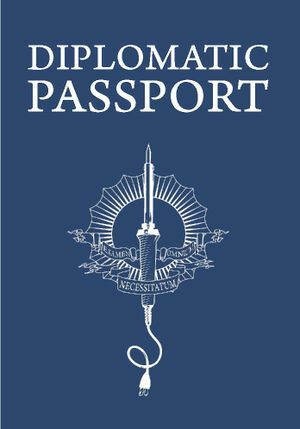 These Hackerspace Passports look a lot like US Passports, but no fingerprints needed! And, rather than a requirement for passing borders, they are intended to encourage it! Hackerspace and hacker cons around the world have made their own stamps, so people can get their Hackerspace Passport stamped everywhere they go! I released the first 2600 of these at Chaos Communication Camp 2011, which seemed appropriate to me, since the previous Camp (in 2007) was the birthplace of the new wave of hackerspaces. The Hackerspace Passports cost me about €1 each, and that's what I sold them for. My hope was that all hackerspaces and all hacker conferences would make their own stamps, so that hackers can travel the world and share their stories with one another by showing off the stamps in their passport. It worked! Each page of the Hackerspace Passport can accommodate 4 stamps of 41mm x 47mm, or 1 stamp up to 89mm x 118mm. 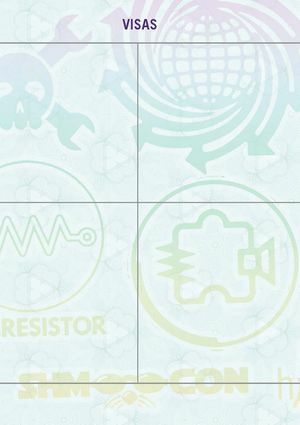 Below are some drafts for website badges to promote that your hackerspace has stamps to support these passports. Clicking on these badge buttons should link back to this wiki or to a custom page that your hackerspace uses to show off their stamps. Note: At this time these are not official buttons but just drafts. Button look subject to change. Check back often. If you want to make your own Hackerspace Passports, then please do! If you make your own then you can do it any way you want! You can call it whatever you want! You can create your own artwork! You can make it any shape you want! You can do anything you wish, since it is yours! You can also grab the original artwork, and use it verbatim, or hack it for your purposes. The artwork is entirely free and open source. See the links, below, for the print-ready PDF, and also the source artwork. To make 2,600 of them, I used a local printer, named Valencia Printing, on Valencia St, in San Francisco. But any printer can print these. Of course, the fewer you make, the more expensive it is to make each one. Valencia Printing used 4-color printing on the inside pages, and used thick cardstock for the cover, using navy-blue and white ink on the cover. It would be even nicer (I think) if the cover were colored vinyl, with silver or gold embossed artwork (but Valenica Printing couldn't do that for me in the short amount of time I had to get 2,600 of them made between when I had the idea in July and before Chaos Camp in August-2011). Thanks to Matthew Borgatti (@gianteye) who did all the illustration, graphic design, and proofing to bring this together. He also runs a store called Sleek and Destroy you might want to check out. You can download the artwork for free (of course)! 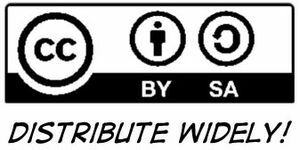 Released under a Creative Commons Attribution Share-Alike License CC BY-SA. The Hackerspace Passports were a huge hit at CCCamp 2011 (and around the world). Hackerspaces (and people, and geek events) created stamps, and now people can travel the world of geeky happenings and stamp their passports. Sometimes Mitch has them. Come by during Circuit Hacking Monday (or anywhere Mitch is giving a workshop wherever he travels). This page was last edited on 3 September 2016, at 14:01.